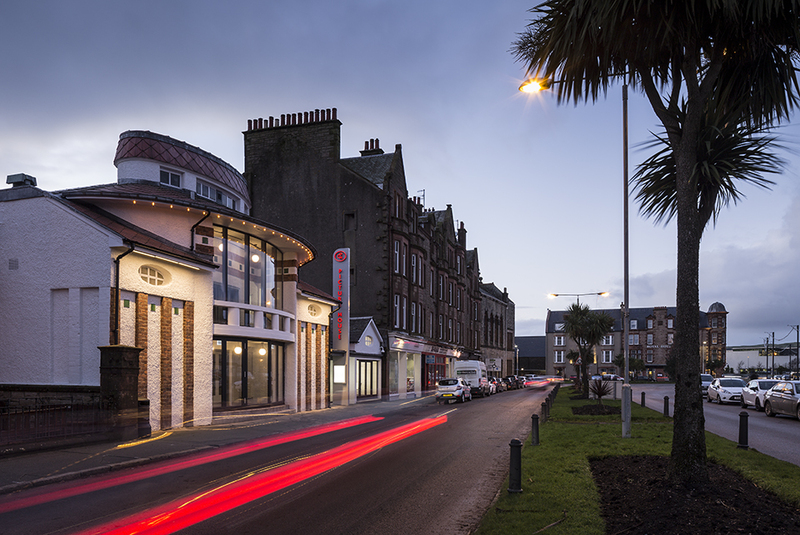 The restoration and remodelling of Campbeltown Picture House by Burrell Foley Fischer has been included on the longlist for the RIBA Journal 2019 MacEwen Award. The recognises architecture (with engineering and landscape) for 'the common good'. They are “looking for built projects that are of real and demonstrable benefit to society, something that architects are well-equipped to achieve”. Campbeltown Picture House has the joint accolade of being one of Europe’s few surviving atmospheric cinemas and Scotland’s oldest purpose-built cinema still in operation. The conservation project restored the art nouveau exterior and the historic main auditorium to its 1930s design and provided a new state of the art second screen, café, education room and other facilities. Designed by Albert V. Gardner, one of the most celebrated cinema designers in the first half of the 20th century, Campbeltown Picture House opened in 1913, funded by 40 local people. Twenty years later, Gardner modernised the interior in the “atmospheric” style. Popular from the late 1920s, atmospheric cinemas transported audiences to exotic places such as European courtyards or gardens. Few now survive with Campbeltown Picture House being the only extant example in Scotland and one of only a handful in Europe. Gardner embellished the cinema with a blue sky with moving white clouds projected across it, and two plasterwork buildings (known locally as the “wee houses”) on either side of the screen that gave the ambiance of a Mediterranean courtyard. These special features have been meticulously restored with other elements of the original design such as the stunning art deco lights recreated by contemporary craftspeople. The re-launch of the cinema marked the culmination of more than three decades of work and commitment by Campbeltown Community Business Ltd; one of the first Community Businesses in Scotland. The design team worked closely with them to develop a scheme that was affordable and would receive the support of a wide range of funders. The impetus for regeneration in the town, was the high level of deprivation in a remote area, a decreasing population, rising unemployment, deteriorating buildings and a lack of inward investment. The restoration was made possible with a major grant from the Heritage Lottery Fund and grants from Coastal Communities Fund, Creative Scotland, Highlands & Islands Enterprise, Historic Environment Scotland, Argyll & Bute Council, The Robertson Trust, Architectural Heritage Fund, and many other donations. Since reopening last December, the cinema has been well received, bringing back old audiences and attracting new audiences across the age range. The extended opening hours makes the facility accessible to islanders on Gigha, as well as to residents of Campbeltown and across the Kintyre Peninsular. In October 2018, it was voted the top independent cinema in the UK by Guardian readers who said “it has retained all of its original charm but is now a welcoming, contemporary space… a fantastic cultural hub in a remote rural area”. The MacEwen award said “This year’s entry is especially strong and very varied, ranging from creative workspaces, loving restorations and temporary structures through affordable rural and urban housing and community hubs to large public infrastructure projects. We had some difficulty whittling it down to the longlist of 36 you see here. From this our judges proceed to a shortlist of a baker’s dozen that we shall reveal from 14 January onwards. We start to announce our commendations from Friday 25 January and will finally unveil our overall winner on Tuesday 29 January. See the rest of the longlist here.